Length: Maximum 4m, average 3m. Lifespan: Up to 12 years in captivity. Food: Lizards, birds, rodents and other small mammals. Distribution: Eastern Africa, from southern Ethiopia to southwest Africa. Status: At present not endangered. Increasing human disturbance could cause a threat in the future. After the king cobra, the black mamba is the longest venomous snake in the world. It is also the fastest-moving snake in the world, reaching up to 23km/h. 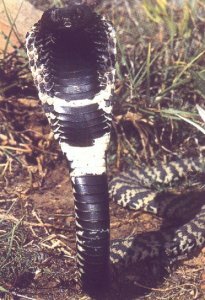 In spite of its name, the snake tends to be greyish-brown in colour. 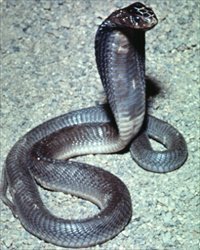 Black mambas spend their nights in holes in the ground - usually disused burrows - or hiding deep among fallen rocks or timber. These hiding places are also fled to by the snake if it becomes alarmed and it will attack any creature blocking the path to its hole. Like all reptiles, the black mamba is cold blooded, and relies on external heat to maintain its body temperature. 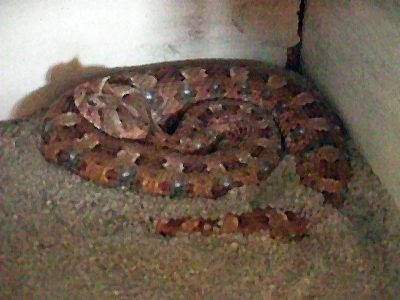 Therefore, it frequently basks in the sun during the day, either on a low branch or a rock, but during the summer, the snake may be forced to take cover in its burrow if it becomes too hot. Food and hunting: Black mambas travel quickly across rough ground or along low tree branches when hunting. They are able to hold their heads up to 1m above the ground when striking, and can hold them 50cm above the ground even when moving. They have very good eyesight and can strike their prey - rodents, bats, birds and lizards like lightning, leaving their powerful venom to finish off the kill. The venom is injected through two hollow fangs at the front of its mouth which lie flat until the snake bites something, at which point small, movable mouth bones erect them. The venom causes rapid paralysis. Enzymes in the snakeÕs saliva start to digest the prey before it even reaches the stomach, and most prey is digested within a few hours. Breeding: This takes place in spring and early summer. 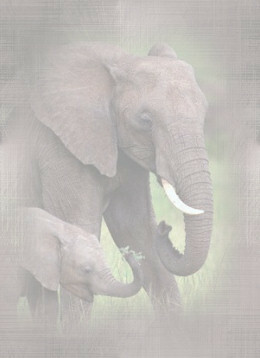 Males may travel long distances looking for females. After mating, the snakes return to their own holes. Females lay between 10 and 25 eggs, usually in decaying vegetation. The decomposition of the vegetation gives off heat, which helps to warm the eggs and speed up hatching time. The shells of the eggs allow water and oxygen to reach the developing embryos. Black mamba hatchlings are around 51cm long, and greyish-green in colour. They are independent immediately and can catch prey the size of a small rat. Within a year, they reach 2m. Young mambas are eaten by mongooses, and even adult mambas are eaten by the secretary bird and larger species of eagle. RANGE: Most of East Africa; from Kenya to Zimbabwe. HABITAT: Found usually in tropical or wooded areas. Mambas are also very good tree climbers. DIET: Feeds mostly on birds and lizards. The mamba differs from other snakes in that after striking its prey it leaves it to die. Digestion of a kill requires eight to ten hours. Mambas have scales on their bodies. 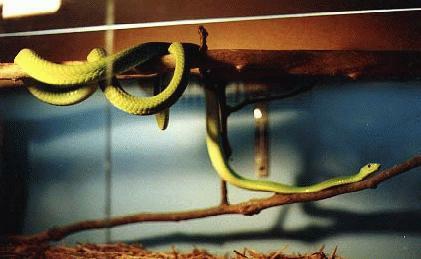 The green in the mamba's body is used to help hide it from its enemies while resting in the trees. The mamba's jaw is adapted for feeding, with the snake's skin being elastic and it being able to dislocate. That is why the mamba can swallow prey up to four times the size of its head. Smell is detected by the use of mamba's tongue, which picks up vibrations. Vibrations can also be picked up from the ground through the mamba's body. When confronted by predators, mambas prefer to flee at speeds up to 7 mph, but will strike when threatened. Mambas rely on abandoned termite mounds and animal holes for shelter. Other areas include sparse brush and rocky areas. where they have become somewhat nocturnal. Enemies are larger animals and humans. Usually will flee, but if cornered or trapped, mambas will hiss and/or strike out to defend themselves. When striking out, if hit the green mamba injects a whitish venon which affects the victim's nervous system; it mostly affects the heart or breathing. The green mamba travels throughout its life alone. Mating occurs in spring after the male finds a female from her scent trail. Copulation can be drawn out to over a couple hours or days. After copulation the female can lay from 10-15 eggs. The eggs are long and thin and range 4-6 centimeters in length and 3-3.5 centimeters in width. 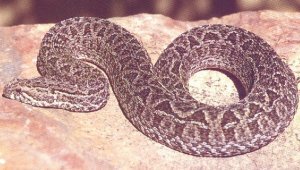 The Namaqua dwarf adder is the shortest venomous snake in the world, reaching a maximum length of just 28 cm. 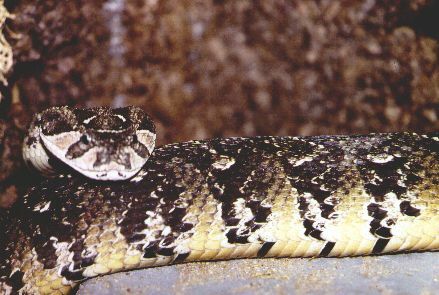 All members of the family Viperidae, containing the vipers and pit vipers, have broad triangular shaped heads and heavy bodies that feature many scales. They have long hinged fangs that allow them to inject prey into their victims; when not in use, these fangs fold back and rest against the roof of the mouth. Between each nostril and eye there is a pit containing heat-sensitive organs, which allow the snake to detect prey. Body colour variable, from black to brown, orange, yellow or mottled. Stands its ground and spreads a broad hood when confronted. Active during the day and early evening. Fynbos, Karoo, arid savanna where it inhabits rodent burrows, disused termite mounds and rock crevices. Frequently found near human dwellings. It well readily enter a house to escape from the heat. Active during the day and early evenings when it might even climb trees to search for food. When confronted this nervous snake invariably faces its enemy, spreading a broad, impressive hood. It strikes readily, except if the attacker remains motionless - then it will soon move off. 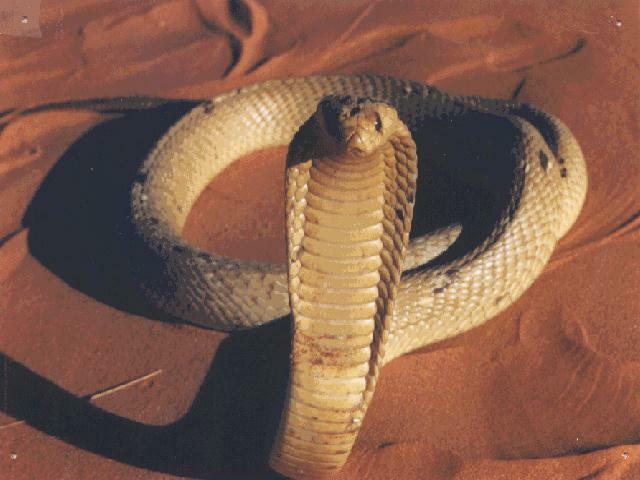 An extremely dangerous cobra that stands it ground if confronted. Bites are common and often fatal, the victim dying of suffocation. 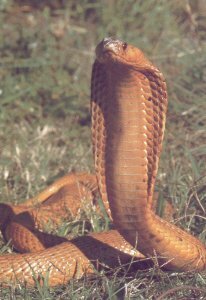 A highly neurotoxic venom, most potent of any Africa cobra. 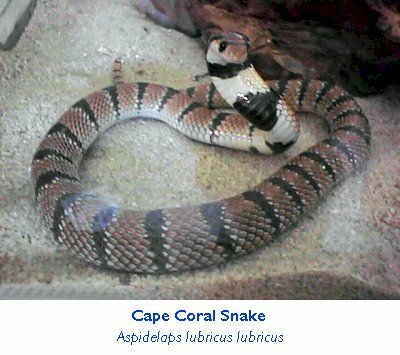 The Cape Cobra feeds on rodents, birds, other snakes, lizards and toads. It will even climb into a tree to reach fledgling birds in their nests. It will also raid sociable weavers' nest. It will frequent human dwellings to find shelter and look for mice. Lifts up to half its body off the ground and spreads a hood. Grassland , moist savanna, lowland forest and fynbos. It is often encountered on smallholdings in and around cities in the area of dams, compost heaps and rockeries. It is mainly active at night, but likes to bask in the sun. If cornered it will lift up to half its body from the ground and spread its hood. It can spit effectively for up to three metres. Sometimes the Rinkhals will play dead, hang limply, but it can strike at any time. Bites are rate and are more inflicted on dogs and horses. Its venom is potentially deadly, but fatalities are rare. A dangerous neurotoxic venom that affects breathing and may cause respiratory failure in untreated cases. The Rinkhals hunts mainly at night. It is very partial to toads. It also feeds on lizards, rodents, snakes, birds and their eggs. The eggs are swallowed whole. Development is this snake's biggest enemy as more and more of its habitat is destroyed. A tuft of 2-4 horns above each eye. Often seen crossing roads after sunset. Prefers gravel flats where it can shelter from the wind. Most active at dusk and in the early mornings. Found on mountains, rocky outcrops and gravel plain in dry areas and savanna. It prefers rocky areas on sandy or gravel flats. It is most active at dusk or early mornings. When confronted it will hiss and strike with force. Note the tufts of horns above each eye. This snake's venom yield is minute. It poses no great threat to man, but it has an extremely painful bite. Mildly cytotoxic with much pain and swelling. 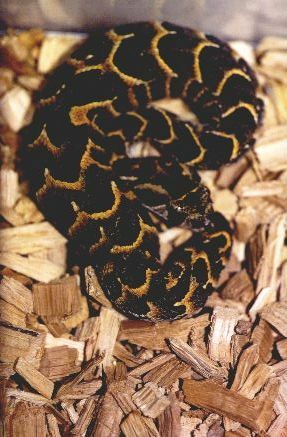 The many-horned adder mainly feeds on ground-living lizards, small rodents and amphibians. Many individuals are captured for the exotic pet trade and exported illegally. They are also often killed by passing vehicles when they are crossing the roads. Lacks chevron markings along the body. It likes to bask in the sun. Montane grassland, fynbos and rocky slopes . A particularly bad-tempered snake that hisses loudly and will strike readily if approached. A Berg adder sunning itself on a rock. Berg adders are common and strike readily when encountered. The venom differs from that of most adder in that it is mildly neurotoxic, with specific action on the optic and facial nerves, causing drooping eyelids, dizziness and temporary loss of smell and taste. It feeds mainly on lizards and small rodents but also amphibians, including rain frogs. Nestlings of ground-living birds and smaller snakes are also taken. Juveniles, however, feed largely on frogs and other amphibians. Its enemies are mainly predatory birds and other snakes. 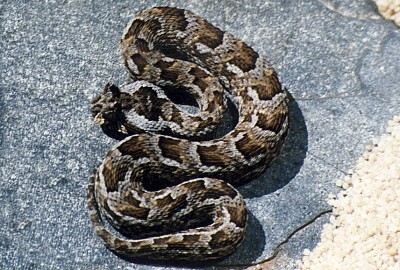 A small adder with a triangular head distinct from the rest of the body. A single horn above each eye. May worm itself into loose sand. Dry, sandy regions in arid savanna and semi-desert areas. A small adder that may bury itself in loose sand by wriggling until concealed. Only the top of the head, eyes and the little horns are left exposed. May inflict a painful bite which causes swelling but poses no real threat. The venom is mildly cytotoxic causing swelling and much pain, accompanied by shock and local necrosis. Feeds on small lizards such as skinks, which it ambushes in the day or geckos and rodents at night. Amphibians are also taken. It uses the darkened tip of its tail to lure pray when it is buried in loose sand. When it strikes it hangs onto its prey while its venom takes effect. It has several black crossbars down the length of its body. Lifts its head off the ground and spreads a narrow hood. Strikes repeatedly while hissing and lunging forward. Rocky outcrops, stony and dry, sandy regions such as desert, arid savanna, Karoo and fynbos. Spend most of its life underground, emerging at night to forage for food. Bites have not resulted in life-threatening symptoms. Very little is known about its venom. The Coral snake feeds mainly on lizards, small snakes and rodents. Many of these snakes are killed on roads just after good rains because then they become much more active. 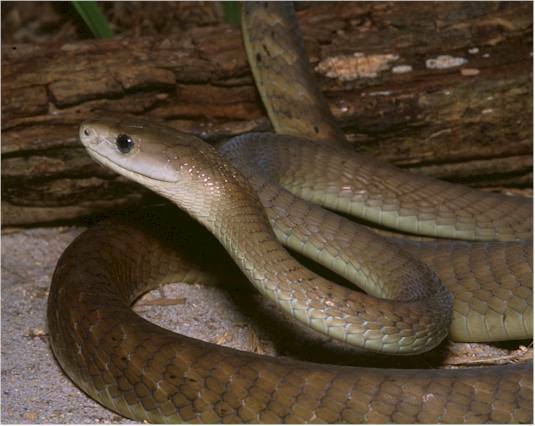 A short, stubby snake with a triangular head distinct from the rest of the body. Yellow to grey-brown with distinct black chevrons on the back. May hiss or puff when disturbed. Common throughout South Africa except for mountain tops, true desert and dense forest. A slow-moving, bad-tempered and excitable snake that may hiss or puff when disturbed. It relies on its perfect camouflage and will rather freeze than move off. The Puff adder is camouflaged against the sand. 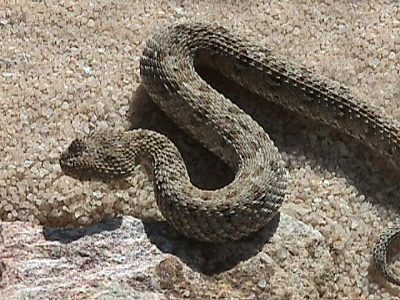 It features prominently in snake-bite accidents. 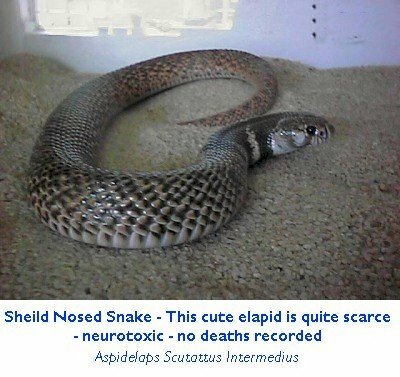 It accounts for up to 60 persent of snake bites in SA. A potent cytotoxic that attacks tissue and blood cells. It usually ambushes its prey. It feeds on rats and mice, other small terrestrial mammals, ground birds, lizards, toads and occasionally other snakes. Rodents are usually bitten and left to die. The Puff adder then follows its prey's scent with a flickering tongue.